LONDON--(BUSINESS WIRE)--The global fruits and vegetables coatings market is expected to register a CAGR of close to 7% during the period 2018-2022, according to the latest market research report by Technavio. A key factor driving the market’s growth is the reduction in the price of editing software. Coatings help in restoring the natural coatings of fruit and vegetables and prevent dehydration. Several post-harvested conventional and organically approved processing solutions are used for coating fruits and vegetables. Some of the popular coatings include vegetables waxes such as carnauba, animal-based waxes such as shellac, and mineral and synthetic waxes. This market research report on the global fruits and vegetables coatings market 2018-2022 provides an analysis of the most important trends expected to impact the market outlook during the forecast period. Technavio predicts an emerging trend as a major factor that has the potential to significantly impact the market and contribute to its growth or decline. At present, the emphasis on reducing food wastage has increased in many countries, especially in regions such as APAC. It is estimated that 1.3 billion tons, which is approximately one-third of the food produced globally, is wasted annually. Wastage of food products leads to financial losses for retailers and manufacturers. Fruit harvesters and exporters apply fruit coatings in order to increase the shelf life of fruits and thus reducing wastage. “Consumers prefer the enhanced flavor and freshness of coated fruits and vegetables. A key factor driving the growth of the market is the extended shelf life of coated fruit and vegetables. Applying wax coatings on fruits and vegetables significantly decreases the chances of post-harvest decay. These coatings reduce weight loss in fruits and increases tissue firmness during transportation and storage,” says a senior analyst at Technavio for research on food service. This market research report segments the global fruits and vegetables coatings market into the following products (fruits coatings and vegetables coatings) and key regions (the Americas, APAC, and EMEA). The fruits coatings segment held the largest market share in 2017, accounting for nearly 68% of the market. This product segment is expected to dominate the global market throughout the forecast period. APAC held the highest share of the global fruits and vegetables coatings market in 2017, accounting for a market share of approximately 40%. The market share occupied by this region is anticipated to increase by nearly 1% during 2018-2022. 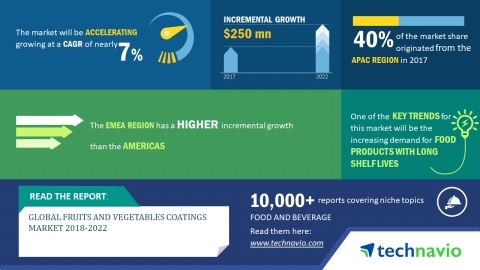 The global fruits and vegetables coatings market is expected to register a CAGR of close to 7% during the period 2018-2022, according to Technavio.